Ray Persons delivers his opening statement for R.J. Reynolds, on trial with Philip Morris in a suit claiming the tobacco companies caused the nicotine addiction and heart disease death of John "Jack" Faricy. Gainesville, FL—A sweeping conspiracy to hide the dangers and addictiveness of cigarettes ultimately killed a former University of Florida marketing professor, an attorney for the professor’s widow said as trial began Wednesday against the nation’s two biggest cigarette makers. Faricy-Pardue v. R.J. Reynolds, 2014-CA-2010. John “Jack” Faricy, 67, a Distinguished Service Professor of marketing at the University of Florida’s College of Business, died in 1998 after suffering from chronic heart and respiratory disease. His wife, Mary Faricy-Pardue, claims Faricy’s death stemmed from a 50-plus year addiction to cigarettes and the role Philip Morris and R.J. Reynolds played in a decades-long scheme to popularize a product the companies knew was dangerous, while casting doubt on the growing evidence of those dangers. Shields said tobacco marketing lured Faricy to become a smoker as a child, ultimately addicting him before he learned of smoking's risks. “It is doubtful that Jack, at age 13, understood that cigarettes contain nicotine and that nicotine was addictive. It is highly unlikely that he understood that with each puff of a cigarette that he was inhaling an addictive dose of a drug,” Shields said. “He just knew that the cigarette companies like the defendants were telling him how normal and acceptable it was to smoke. Shields said Faricy became so addicted to cigarettes he smoked up to four packs a day, often waking in the middle of the night to light up. Shields told jurors Faricy once broke into tears and told his wife that he couldn’t quit cigarettes after she found him smoking in the middle of the night at the family’s kitchen table. After several unsuccessful attempts to quit, Shields said, Faricy finally stopped smoking in 1995, three years before his death, while hospitalized from a heart attack and with the help of nicotine patches. 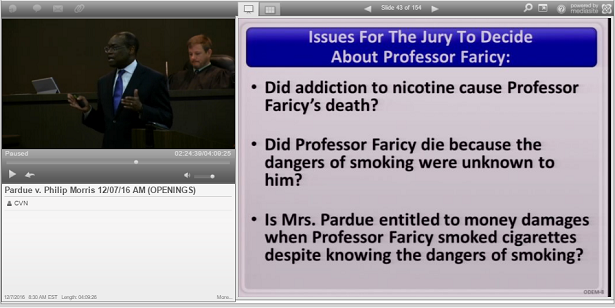 The Faricy-Pardue case is one of thousands of Engle progeny cases in Florida, which stem from a 2006 Florida Supreme Court decision decertifying Engle v. Liggett Group Inc., a class-action tobacco suit originally filed in 1994. Although the state’s supreme court ruled so-called Engle-progeny cases must be tried individually, it found plaintiffs could rely on certain jury findings in the original case, including the determination that tobacco companies had placed a dangerous, addictive product on the market and had conspired to hide the dangers of smoking. However, individual Engle-progeny plaintiffs must prove a variety of elements to establish class membership, including nicotine addiction and a causal link between that addiction and specific health problems such as heart disease. Persons told jurors Faricy never sought help from those he knew who successfully quit smoking, and he never enrolled in University-sponsored cessation programs. “Some of those programs had success rates of between 95 and 100%. The evidence will be that Dr. Faricy never availed himself one time of any of those programs,” Persons said. Mary Faricy-Pardue is represented by Bob Shields, of Georgia's Doffermyre, Shields, Canfield & Knowles. R.J. Reynolds is represented by King & Spalding’s Ray Persons and Kathryn Lehman, from the firm's Atlanta office..
Philip Morris is represented by Arnold & Porter’s Keri Arnold, from the firm's New York office. .